Abuse and scandals are certainly not limited to Weinstein and Hollywood. Indeed they are not limited to sexual matters. Take the case of the Middle East Institute (MEI) in Washington DC for instance. More and more in recent years MEI has become a political whorehouse trading “honors” and “favors” for big money. Over and over royals from Saudi, UAE, Qatar, Bahrain, Kuwait, Oman and beyond, along with business tycoons from Egypt and Jordan and beyond, have paid their way to getting awards at banquets and gatherings of one kind or another; and in some cases to kind of self-publishing their books with an MEI stamp of approval. 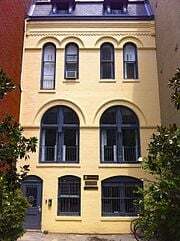 After decades of languishing in their aging N Street townhouse near Dupont Circle MEI is in the midst of a structural remake — largely funded by the largess of Arab royals and their cronies. They claim to be raising funds from their dwindling and actually quite insignificant membership; but that’s just the cover story for all the big bucks which wreck of oil, blood, and weapons. In some ways MEI is a kind of retirement home and reunion gathering place for State Department hacks, nearly always with a Former Ambassador — one already collecting government money for a cushy life in retirement — double-dipping with more salary and “expenses” from MEI. But if MEI kept just playing that role one could overlook the rest and skip the nicknaming. Truth be told many years ago I was personally asked by the then MEI President, Ambassador Dean Brown, to be on a year-long study group charged with issuing a major report about the past, present, and future of U.S. policies in the Middle East. It was quite a prestigious group this very young journalist new to the ways of Washington joined back then for so many meetings with so many scholars and diplomats. But even then I knew something was wrong with MEI; and so even then decades ago mine was the only dissent published in the major report issued jointly by MEI and The Atlantic Council. Of course, lol, as I forecast in my dissent, they never invited me back. In recent years, now under the frizzy leadership of Ambassador Wendy Chamberlain, MEI has started holding more policy meetings in order to use the internet to spread it’s largely U.S.Government/Arab States messaging and advocacy. So that’s the reason for this little warning comment today to help people realize that MEI is both a State Department front organization — one using largely retired Foggy Bottom officials — as well as a kind of hired contractor for rich Arab regimes and those who hang out with them. The high-powered highly-paid Saudi Lobby is far more hidden. 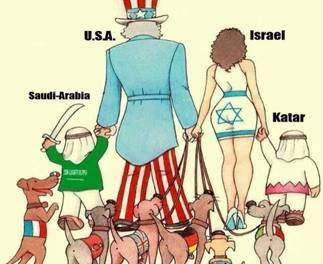 And besides in recent years the Saudis have enlisted the Israel Lobby on their side as well….even if they don’t realize how they are used and manipulated by it. 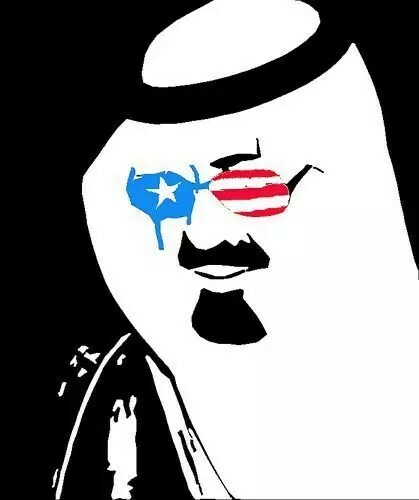 The Saudis are now willing to do anything at any cost that they think (rightly or wrongly) protects the “Saudi” regime and challenges their arch nemesis the Shia Persians of Iran. Today though a bit more about the now-thinly masked Saudi Lobby known as The National Council on U.S.-Arab Relations and its sidekick The Washington Report on Middle East Affairs. Both of these are Prince Bandar creations back in the 80s, both are kept on a short leash, both are used and exploited at will by their Saudi sponsors/keepers. 2) No mention through the two-day proceedings of the very much heightened Saudi-Israeli alliance, including only quasi-secret visits of top Saudis to the Jewish State likely including the Crown Prince himself since their last annual gathering. 3) The so-called “Palestinian Ambassador” gave a nothing speech and kept using the mild word “bad”, “bad”, “bad”, to describe how the Israelis treat the Palestinians without any mention of how Abbas and his “Palestinian Authority” are themselves sub-contractors of the Israelis/Americans paying his salary! 4) The Panel about what’s going on in Palestine was totally composed of U.S. government officials and USAID contractors. 5) Beyond all the hypocrisy from Prince Turki (see my previous comment last week) the Prince insisted the current GCC crisis has been caused by “Qatar chirping outside the flock”! Turki must have had some new Jewish/Zionist/American speech writers added to his team. What may be the most public arm of the Saudi Lobby in Washington held it’s annual get together at the Ronald Reagan Building this week. It calls itself a National Council and an educational association. But in reality it is a clever out-front p.r. group for the Saudis, the GCC, and the many corporations who cash in on all the money and arms sales. By Washington standards just a little gathering of little consequence; but even so they did bring a few top level key-note speakers for the cameras to show back in Arabia — the 4-star General commanding Centcom plus one of the most senior Saudi spokesmen, Prince Turki, a regular actually, who got his usual standing ovation. But listening yesterday to a Saudi cry about refugees, when his country has done so much to create their plight and so little to alleviate; and listening to a Saudi lecture Americans about “one man one vote” when his country…well we all know the realities there; and listening to a Saudis warn the Israelis that they better finally get with the “peace process”, when in fact the Saudis are now in an increasingly close behind-the-scenes alliance with the Zionist State; and listening to a Saudi continually berate and chastise and threaten the Iranians for “interfering in the internal affairs of neighboring countries and supporting terrorism”…well enough said. P.S. No mention at the conference of JASTA or references to the very young, brash, irreverent Saudi King (actually his official title is still Crown Prince), nor of the aging King’s first ever recent Royal visit to Putin and how his Kingly deplaning escalator broke down with him on board upon his arrival in Moscow (wink). Let’s be very clear about this. The Palestinians have every right to fight, resist, and attack those who have so brutally and illegally occupied them; destroying their villages and homes; carving them up into worse-than-apartheid prison-like enclaves; assassinating and and imprisoning their leaders; and terribly defying international laws and a multitude of U.N. resolutions. The Israelis, the Jewish/Zionist/Evangelical organizations that make up their “lobby”, and the United States itself, are all guilty and complicitous of such conduct over a long period of modern history. 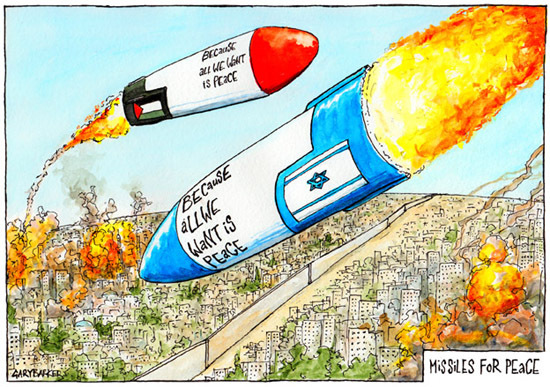 And so fighting and resisting and attacking Israeli occupation and settlement building is fully justified. Furthermore it is up to those suffering and struggling and actually doing the fighting to decide what they will do and when and how; not to comfortable arm-chair pundits and so called “peace-process”, largely super hypocritical, advocates. After unprecedented investigations Facebook and Twitter and others have found evidence of Russian “meddling” via social media in the U.S. election. Amazingly, after all the investigations the amount of money said to be involved is in the “tens of thousands” or “about 100,000″….in other words hardly anything despite all the hoopla. And so far there is not any direct evidence of Russian government involvement or even one specific example of what the “Russians” did using social media that could have seriously impacted the election. But if the Israelis and their multi-faceted Israeli/Jewish Lobby organizations were being investigated for the same things during this and past elections, and with regard to Congressional legislation and President actions, there would be far more evident and far far more money involved. Not to mention that the multi-millions the American spend in Russia with NGOs and media is far far more than the pittances all the investigations have dome up with about what the Russians may or may not have been doing in the U.S. And that doesn’t even begin to deal with the CIA and NSA and their spying and infiltrating on the Russians in so many ways for so many years. The bigger motivation propelling Washington when it comes to Russia is the huge success of RT and Sputnik….news sources that are quite out front and quite public and which in many cases are much better than the long-USG-financed institutions known as Voice of American and Radio Free this and that. Also of course the Americans are pissed that Russia has outplayed the US in Syria and that has really upset those who control the US/Israel/Saudi alliance. So, in short, the Americans are desperate to be able to pin something on Russia in order to restrict and reign in RT, et. al. Trump’s “storm” will likely be a “Quarantine” of North Korea — in reality a blockade which is an act of war — but the use of this word “Quarantine” makes it not quite legally so. That’s why JFK ordered the military at the time of the Cuban Missile Crisis to use the term “Quarantine of Cuba”. 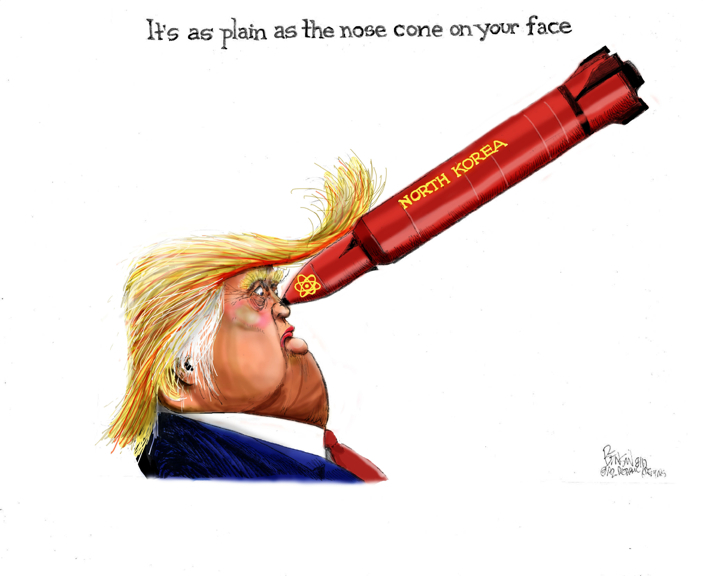 Expect this from Trump and the Generals/Admirals who salute him when the N Koreans fire their next intercontinental missile claiming it can hit the USA with nukes. That will be the excuse, the trigger, for Trump to push closer to war but leave it to the North Koreans to decide whether to capitulate or escalate. At the same time he will be cornering both the Russians and Chinese defying them to either accept American power or challenge it. President Xi will be in the most uncomfortable position of all if this comes before or during next week’s Party Congress. If it comes after the the Party Congress, then the ill-advised visit by Trump to China will be pending and he will try to brandish what he’s threatening to do as a kind of Sword of Damacles. If it comes after the China visit China will look, and maybe even be, complicit. “A TIDAL WAVE OF AIR POWER IS ON THE WAY!” proclaims the commanding American General in Afghanistan this week. Once again the Pentagon and the military-industrial titans are in charge bringing immense death and destruction in war criminal proportions to another country. America’s longest war still has no end in sight. And if it’s up to the Generals it will spread one way or another to Iran, Pakistan and Lebanon, beyond what has already been done to Iraq and Syria. The Israeli and Saudi footprints are all over this but for the above-mentioned countries (beyond Yemen, Somalia and others) it’s the Pentagon, the CIA, and the “contractors” who are fully in charge, who benefit tremendously, and who must one day be held responsible. Comments : Comments Off on TIDAL WAVE OF DESTRUCTION!